I'm Anika from Anika's DIY Life! I love to inspire others to create a home filled with your own unique personality by empowering you with ideas, tools, and skills you need! I want to show you that if I, having NO experience with DIY, can do this, YOU totally can too! I have always been crafty – the handmade card and little crafts kind of person – not the hammer and saw wielding DIYer. Then in 2011, on a quest for some cute furniture for my daughter, I stumbled on to the world of DIY blogs! I learned to build furniture – thanks to my biggest inspiration Ana White! For a while, I designed and built furniture for kids on the side while working full time. That business and hence the blog was called Little Free Monkeys. I rebranded in August 2016 to Anika's DIY Life. I am a physicist and electrical engineer by training but have since been fortunate enough to quit my full-time engineering job to spend time with my then newborn boy and little girl. At the same time, we relocated across the state to a new town, moving from our beautiful first home to a small rental. It was the perfect excuse for me to start my blog! I live in Southern California with my amazing husband who I met in grad school and 2 kids. I love colors and infuse them in fun unexpected ways in my decor. Be sure to check out my blog and follow me on this fun, colorful journey on Pinterest, Facebook, and Instagram as well! 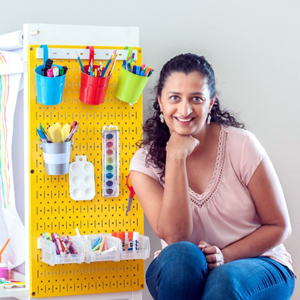 What Wall Control Pegboard Products is Anika from Anika's DIY Life Using?